The gloss, luster and reflective finish that are offered by the new marble floors diminish with time. As the time passes by, you will find the tiles have lost their luster, are dull and have more scratches added to them. The problem is a cause of monetary loss also if you are trying to sell your house. 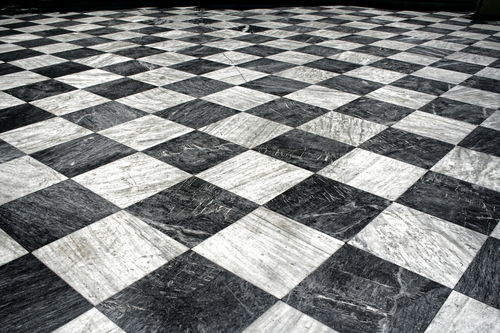 For recovering the originality of the marble floor, it is necessary to restore them as cleaning alone does not suffice. Below are given some tips and methods which will help you to conduct your marble floor restoration process smoothly so that the floor can be restored to its original beauty. You must locate the broken and loose tiles and then you must remove them completely. This can be done by first stripping the grout that surround the loose/broken tiles and then by cleaning all the grout by using a utility knife. Next use a ply-bar for pulling the loosened and broken tile away from the marble floor. Move away all the removed tiles from the floor. Tiles are removed, but the mortar that originally held the marble stone tiles in place still remains spread on the sub- floor. You can clean this mortar by using a rotary tool that has an inbuilt carbide blade. Turn on blades of the tool and hold them at an angle of 45 degrees so that the blades can cut the sub-floor and remove the mortar. After a while, turn off the blades and remove all the non-valuable mortar. Use a thin set mortar for replacing all the loosened tiles in their respective places on the floor. You can easily spread the new mortar by using a trowel made up of notched steel. The notches that the trowel contains can be used for raising the mortar to form a series of mortar ridges which provide for enhanced gripping. Use the carpenter’s level for adjusting the newly installed loose tiles. You should also replace the old broken marble tiles with the new tiles. Purchase the new tiles in such a way so that they can form an easily absorbent kind of beautiful pattern with the existing marble floor tiles. Leave the tiles to set themselves completely for two hours and do remove all the excess mortar from the floor surface. You can use a sponge for removing dirt and excess grout that remains on the surface after the floor restoration process is over. Use sandpaper for honing all the scratches that the marble floor tiles might be having. Marble floor polishing can be done by using an angle grinder that has a polishing pad. Once the tiles are firmly set in, use a stone sealant for sealing the surface and let it dry for 48 hours before using the floor. Great job E-Dry!! !The E Dry team arrived onetime and steam cleaned my lounges. They cleaned up after themselves and the lounges look great. Good job. Highly recommended team. The Carpet Cleaning was on time & courteous…. We asked the carpet to be raked after cleaning & he said it was not necessary http://sweeneycleaning.net/locations/port-charlotte-fl/.